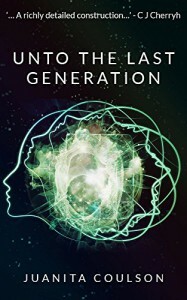 Originally published in 1975 and re-released as an eBook in 2015, Unto the Last Generation is proof that a forty-year-old story can still be relevant. More than a decade after a virus caused all women to become fertile, our protagonist - Richard Parnell, director of the Life Sciences Project - stumbles across someone who may be the hope of humanity... an eight-year-old girl, Ria. This is not a very showy tale, especially compared to some of the more recent series - Divergent and Hunger Games, for example - but it holds its own, with a solid concept, different subsets of characters with well-established reasons for their behavior, and a thread of hope that runs though even the darkest sections of the book. My biggest complaint is that, even though the story is complete, the book almost feels too short. I received an advance copy of this book from the Publisher, via NetGalley, in exchange for an unbiased and honest review.